First, there were barbershops. Then there were barbershop quartets. Then there was a Society for the preservation and Encouragement of Barbershop Quartet Singing in America. Then there was the Hills Creek Four quartet. Then, in October, 1946, there was Eugene Chapter No.292, later known as the Cascade Chorus. Then a half century went by and here we are. The Hills Creek Four, a quartet that sang together for their own pleasure and the entertainment of others in this area, consisted of Frank Graham, Ernie Murphy, Harry Huffman and Bud Leabo. 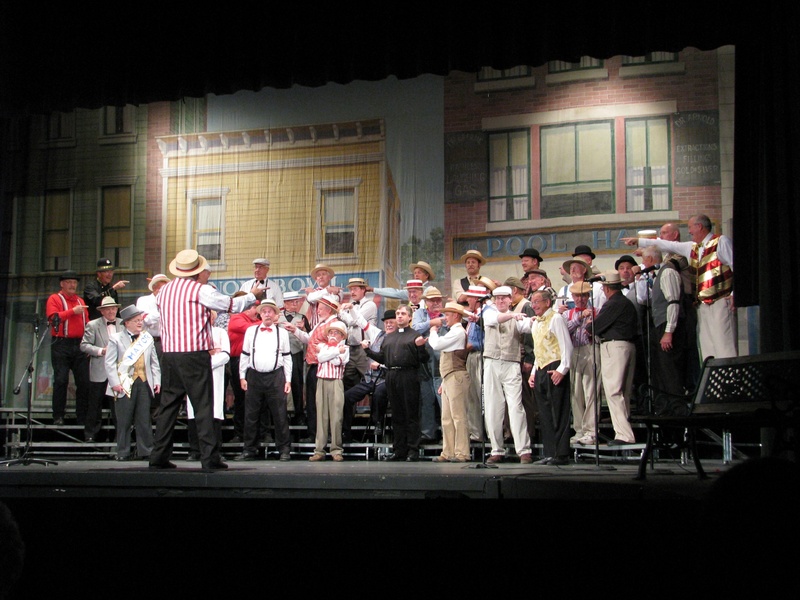 One of the first twenty chapters of the barbershop society had been organized in Wichita, Kansas. Among its members in 1946 was a bass named Harry Barnes, who owned a wholesale lumber business and periodically came to Lane County where the lumber was. One of the local businesses he called on was the Trio Lumber Company owned by Bob Bronson, who enjoyed barbershop singing. When Harry called on Bob, they naturally talked wholesale lumber and just as naturally talked singing. Harry kept suggesting to Bob that there should be a barbershop chapter here. Bob finally talked to Frank Graham about this society dedicated to the style of music the Hills Creek Four sang. Graham talked to Murphy and between them they persuaded a couple dozen men to attend a meeting at the studios of KUGN radio. The new chapter began to meet weekly and spent most of the time singing, since they had little idea what else a barbershop chapter could-or should-be doing. Typical of their attitude is the last entry in the minutes of the August 12, 1946, meeting: "So that the singing could be started, a motion was made to adjourn the business meeting. Motion seconded and passed." The focus on singing came naturally to a bunch of men who all liked to sing and was helped along by the presence of a very-able woodshedding harmony instructor, Charles Sargent. Sarge became the first director of our chorus-and also the baritone in our first quartet, the Pioneer Four-during the 18 months he was in the chapter. He then moved to Tucson and over the years started many chapters in the Southwest. He sang baritone with Tucson's The Wranglers at the 1948 contest in Oklahoma City. At the time we were chartered, the only chapters north of San Francisco and west of Missouri were in Port Angeles, Tacoma and Portland. 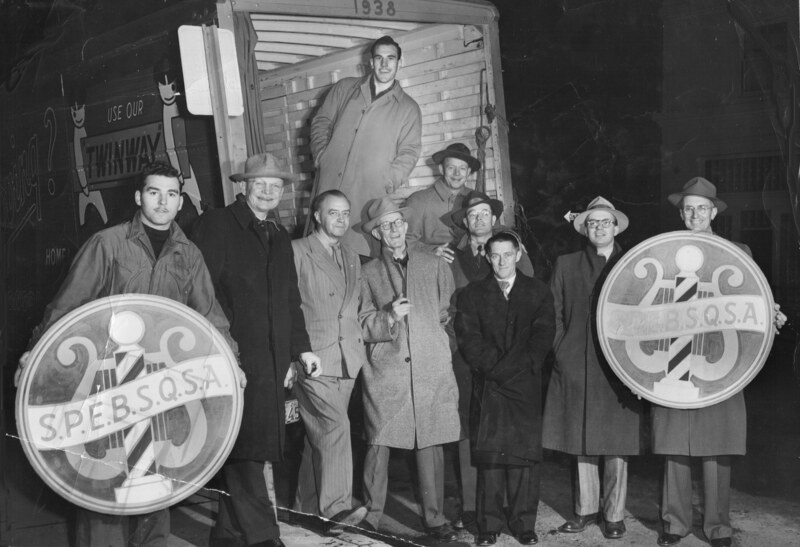 Frank Graham contacted all the Chambers of Commerce in the Northwest about organizing local barbershop chapters and within a year there were chapters in Roseburg, and Klamath Falls. In the first five years of our existence, we sponsored five new chapters-Klamath Falls, Salem and Roseburg, Oregon, and Orinda and Eureka, California -- and assisted with eight others. When we were first chartered we were in the society's Far West District, but the growth of new chapters was such that a new district for the chapters in the Pacific Northwest seemed appropriate. Accordingly, while they were attending a barbershop show in Santa Monica, a delegation comprised of Bud Leabo, Bob Adair, Frank Graham, and E.C. Murphy met with Far West District officers and secured their consent that the northern portion of their district be separately organized. into a new district. That done, the Society was petitioned for and granted organization of a new district. The first president of the Pacific Northwest Association of Chapters (later Evergreen District) was E.C. Murphy, the same man who had become the first president of the Cascade Chapter the year before. In all, five Evergreen District presidents have come from our chapter - more than from any other. In 1946, dues were $4.00 per year ($5.50 if a lapel pin was desired), which was quite a bargain, ,considering that they included the cost of a membership certificate, pocket identification card, woodshedding (that's what barbershopping was back then-written arrangements only came in vogue in the early fifties) and the fellowship of other men who shared a common interest, not to mention that thing so important to so many egos-the chance to perform before audiences, even before audiences who would pay for the privilege of hearing our music The special bonus for chorus members in 1946 was touring Eugene in a truck wired for sound and doing Christmas caroling at the homes of shut-ins' old folks' homes and hospitals. Illustrating how some things have changed over the years, the policy in '47 was that after the business portion" of rehearsals – but not before – the stimulus of a little "spiritus frumenti" was allowed. Our involvement in the local entertainment scene is further demonstrated in the minutes of a meeting two months later in which it was reported that we had been asked to participate in a very Little Theater show and to perform at the Willamette Valley Logging Conference On October 8, 1949, we put on a show called, appropriately enough, the First Annual Parade of Quartets. It featured eleven quartets from an area from San Francisco on the south to Port Angeles on the north to Richland and Klamath Falls on the east. The only participating chorus was our own which then numbered 46 singers and a director named Bud Leabo. The Annual Parade of Quartets show was renamed the Singin'est Nights of the Year in 1966 and that's what it's been ever since. On Friday, October 6, 1950, four of our quartets drove to Brookings to do a show with quartets from Portland, Roseburg and Klamath Falls and a Klamath Falls chorus. Due to severe flooding on the coast some others could not get there, but the show did go on in the opera house. Power was out, so lighting was by Coleman lanterns. The roads home were not passable, so our guys went as far as they could each day and did an impromptu show for the locals before settling in for the night: Sunday night in Gold Beach and Monday night in Bandon. By Tuesday they made it the rest of the way home, broke and tired – both from the unexpected duration of the trip and from what they saw as their duty to party every night they were on the road. We were singing as a chorus at a time when the Society's focus was so fixed on quartets that there were no competitions for choruses. We performed as a chorus as early as 1948 at a Christmas party in the Eugene Hotel. Our early start singing as a chorus rather than just an aggregation of actual and prospective quartet members served us well. 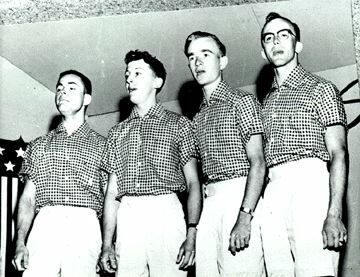 When the first chorus contest in Society history was held in Detroit in 1953, we were selected by the Evergreen District board to represent the District and we came away having placed fourth under the direction of Bud Leabo. In the 1956 International contest we placed second. 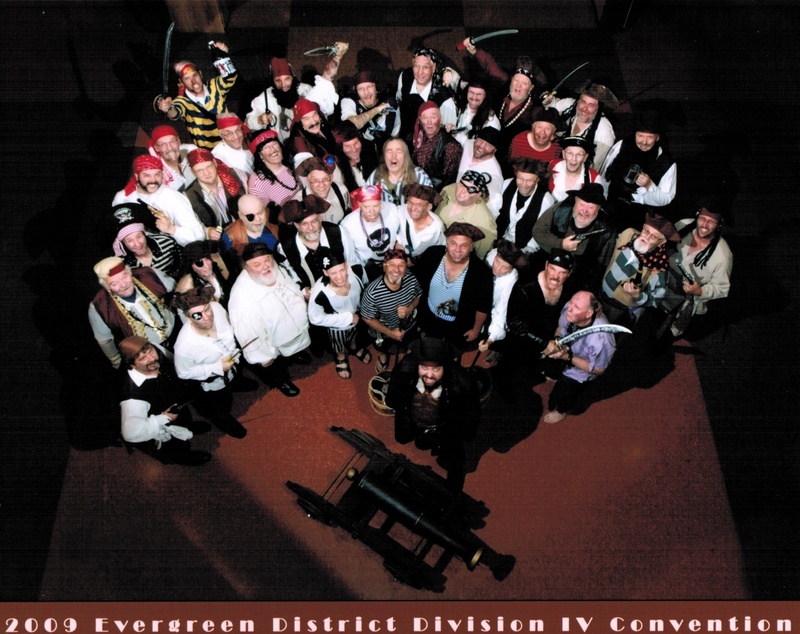 To this day, no chorus from the Evergreen District has ever ranked higher. "This litter of kids gets around whenever the spirit calls us,' our last jaunt being a 350-mile trip to Portland, Ore., where we had the honor to render a half-hour sacred concert, for the Youth for Christ movement in the Civic Auditorium, before several thousand listeners, and this was done without the use of books- quite a job for us youngsters. We also have a secular program of the same length, in the rendering of which, we do not use books." “The Zenith Radio Corporation of Chicago furnishes us hearing aids, and keeps them in repair, and the batteries in shape, all with their compliments; The Rodeheaver -Hall-Mack Music Co. of Winona Lake, Indiana, sees that we have several separate editions of musical books for male voices, at their expense." At the other end of the calendar was our Sharp Four who were, in 1955, all 18-year-old seniors at Eugene High school, Bob Hufman, Ron Lodge, Jerry Holloway and Wilson Barber. They had started singing together as sophomores, represented the District on the International stage in Miami in 1955 and were still together while students at the University of Oregon in 1957. Because of the distance, our district was not represented in the Miami contest in 1955, but the Cascade Chorus nonetheless hit the road, traveling to Idaho to demonstrate our singing style at the Northwest Music Educators Conference. While in the neighborhood, we went over to the Mountain Home Air Force Base to entertain Strategic Air Command personnel stationed there. And we were busy! In 1956 we logged 22 chorus appearances and our quartets performed over 200 times. Our roster showed 77 members that year. And talk about membership drives-in August, 1958, the Register-Guard reported that we had just initiated 18 -- that's right, 18 -- new members. Of course, we have done social stuff as well as competitions, shows and singouts. Back in 1958, the Coos Bay chapter rode a couple of dune buggies to a remote lake on the coast for an evening of singing, hot dogs and libations. This was so much fun that by 1960 they had made it a two-day outing and included members of other chapters and families. As you would expect with a crowd like this, a quartet contest soon evolved, with the quartet memberships being determined by lot and with such names as the “Sandblastards", the "Sons of Beaches" and the “Wind Breaker's". The event grew until the dune buggies were carrying as many as two hundred people, tents, the fixings for meals for the weekend and even portable generator (supplied by our own skillful graphic artist Joe Kats, who over the years has designed and built our stage sets and done other needed art work) over the mile-and-a-half trip to the outing site. By the end of the Coos Bay Sandblast in 1965, people from as far away as California and Tacoma were attending. The Sandblast tradition continues to this day, but now it is an August weekend at the park in La Pine and hosted by the Bend chapter. Intended to replace the outing to the coast, it was the brainchild of our Jim Ferguson and Jerry Koskela, a member of the Medford chapter. They invited all Oregon chapters to La Pine in 1969 and there were enough in attendance that the La Pine Campout survived and became a tradition which now features a mixmaster chorus, quartets ranging from the excellent to the egregious, sleeping bags and RVs, Chord Buster Olympic Games for the kids, a pot luck dinner, a few card games and, of course, beer. And socializing between chapters was not strictly an Oregon idea. In 1959 we became temporary custodians of a barberpole red-and-white-striped missile (missiles were the big thing back in those Cold War days) which had originated with the Marblehead, Massachusetts, chorus and was designed to encourage inter-chapter visits. It came to us from the Klamath Falls chapter and, since no chapter was supposed to keep possession more than fourteen days, it was leaving right away with Cascade member Marvin Haley on his Hawaiian vacation The plan was to give it to the Honolulu chorus and let them worry about how to carry it to another chapter (the nearest being 2100 nautical miles away on the Mainland) within the two week limit. Not only did we communicate with other chapters across the miles by barberpole missile in 1959, but we also communicated across the years. We were one of 23 local organizations to place materials in a 100-year time capsule buried in Willamalane Park in Springfield at 2:00 p.m. on Saturday, March 3, 1959. When the capsule is disinterred, the Cascade Chorus will be 112 years old. Time does fly when we're having fun! We had, in the 60's, an interesting promotion which has since fallen into desuetude. The certificate of membership in the Exalted Order of the Crow (Cascade Chapter) certified that the member "... is privileged to appreciate and enjoy the Close Harmony and locked Chords of the Barber Shop Singing". The certificate further served as an invitation to visit chapter meetings and be listed in our Booster Guide. By 1961 we were representing the District in International competition for the fifth time, this time in Philadelphia. Bud was still our director and we came in eighth. These trips were becoming more expensive, too-we were quoted five dollars per person for four-man dormitory rooms at the Benjamin Franklin Hotel. We had another quartet with a difference in 1964. The Melo-D's consisted of Dave, Dan and Dean Roberts and their father, Wayne. 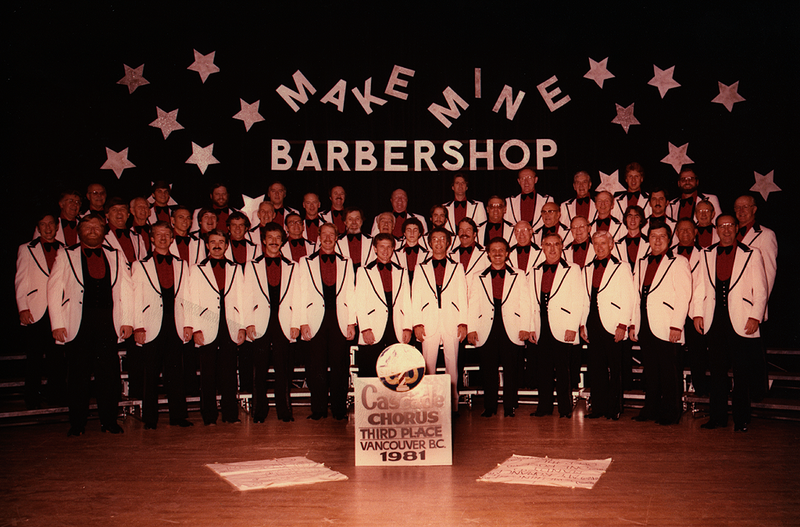 There was an actual barber, Elmer Beights, in the chorus in 1966 and he sold more than $600 worth of tickets- at $1.25 to $2.50 per ticket-to our annual show that year. By 1969 our annual show included the local Sweet Adeline chorus, the Timberettes, both choruses being directed by Bud Leabo. Many in the community still remember the combined choruses on the stage at South Eugene High School singing the patriotic medley written and directed by Bud while the image of the Stars and Stripes was projected onto the stage. The practice at that time was to have a local service club co-sponsor the shows to raise money for their charity. That year the Eugene Active 20-30 Club was the co-sponsor and their charity was the Eugene Hearing and Speech Center, which had received proceeds of $13,894 from our shows in the preceding three years. Other recipients through the years have included Eugene Jaycees, Rotary, Kiwanis and Lions charities, the Pearl Buck School for retarded children, McKenzie-Willamette Hospital, Boy and Girl Scout groups, PTA benefits, the March of Dimes, school benefits for equipment and scholarship funds and a benefit to help send a Drain boy, Gary Winslow, to the Mayo Clinic for heart surgery. We have also made contributions to the SPEBSQSA national charity, Heartspring (formerly the Logopedics Institute) of Wichita, Kansas, which assists the handicapped, primarily children, in developing speech and communication skills so that they may lead happier and more productive lives. Of course, our sociable life has not been limited to jaunts to the Sandblast on the coast or the La Pine Campout. We have had fine afterglows, Christmas parties and picnics in the local area over the years. 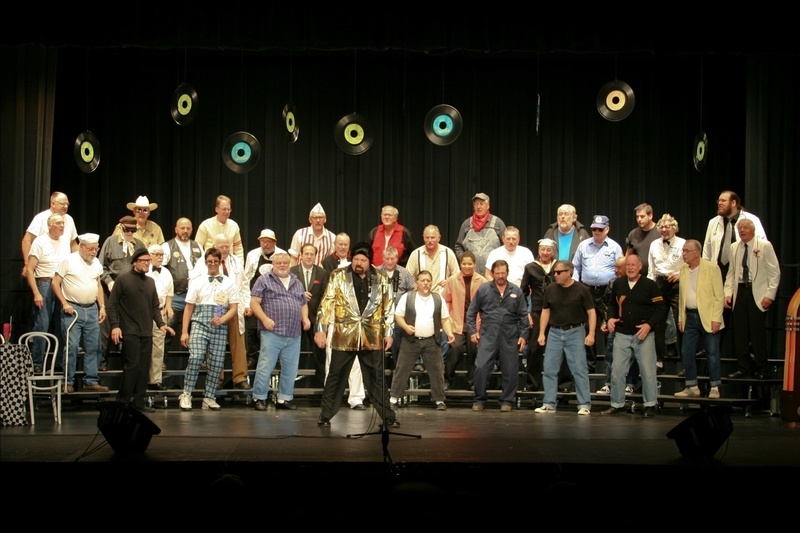 And for a while before and after 1970 members Jim Rivers and Ray Holcomb, who had cabins near Florence, would invite the chorus down for long Memorial and Labor Day weekends. These weekends would run to clam digging and chowder, beer barrels and harmonizing, penny-ante poker, horseshoes, touch football and your occasional yacht trip to Cushman or dune buggy ride at Lake Cleawox. And we continued to improvise so that our out-of-town singouts would be fun for us as well as entertaining to our audiences. 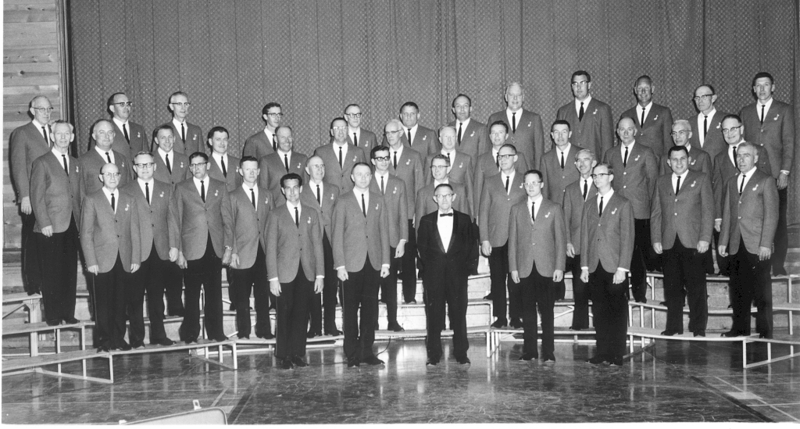 It was in about 1970 that about thirty of us (accompanied by 23 or so wives and girlfriends) went to Seaside to sing for a convention of around a thousand insurance agents. Before leaving Eugene, we had had to pass the hat for the cost of a baby sitter so that one of our enthusiastic new members and his wife could join us. Unable to find a spot in Seaside where we could hold an afterglow that evening, we called the Elks Club in Astoria and they welcomed us. Their steak dinner cost $4.50 and was worth every penny, the band played great forties dance tunes and we concluded the evening by giving the Elks a Cascade Chorus/Barnacle Bill mini-concert. We almost had our own Harmony Hall for two and a half years in the seventies. We had been using the Celeste Campbell Senior Center for rehearsals without charge and had our properties stored all over town in various homes, barns and garages. So when the senior center told us they would begin to charge rent and that they would need the building one Tuesday evening (our rehearsal night) each month, we decided to try to buy a facility. The Free Methodist Church building on Fourth Street in Springfield was available, so ten members of the chorus, headed by Ken Schneider, who could raise the necessary down payment formed a small corporation and bought the properly in March, 1976, on contract. They rented it to the chorus for the amount of their expenses, agreeing that the chorus have an option to purchase for what the investors had in it. Due to problems related to finances, maintenance and upkeep responsibility the investors sold the property after two and a half years to the City of Springfield. In 1981 we got a new directorial team, with Mel Knight as director and Jim DeBusman as his assistant. In the fall of 1982 we won our first District championship in 22 years. This put us on the International stage in 1983 in Seattle, where we took eighth place. In the 22 years since we had finished eighth internationally in 1961, no other Evergreen chorus had ranked that high. 1982 saw us advancing a further step as we produced our first phonograph record, Cascade of Roses, with cuts by the chorus and four quartets: McKenzie Touring Company, The 4 of Us, Cascade Connection and Best Intentions. The next record, As Time Goes By, came the following year and in addition to the chorus, there were songs by McKenzie Touring Company, Cascade Connection and Sound Gallery quartets. 1982 was also the year that Bud Leabo, who had died the year before, was one of the first two inductees into the Evergreen Hall of Fame. This was the first of five Hall of Fame Inductions of members of the Cascade Chorus - no other Evergreen chorus has had so many individuals so honored. The Hult Center for the performing Arts was the venue for the 1983 Evergreen District Quartet and Chorus competitions, which we hosted. We also won the chorus competition, which sent us to our second International competition in a row in St. Louis in 1984. And less than two weeks after the St. Louis contest, the chorus was back in Eugene performing for the 16th World Conference of the International Society for Music Education, which had not met in the US for 18 years. Since two International champion quartets and one District champion quartet were in town for the conference, we were able get them into our cabaret that weekend, showing an audience of 1300 people more headliners then they had ever seen in one show. At about the same time, we were presenting Special Delivery, a mixed quartet consisting of two married couples. The men were from the Cascade Chorus and the women were a present and a former member of the Greater Eugene Sweet Adelines. By 1986 the Society had called our director, Mel Knight, and assistant director, Jim DeBusman, both to Kenosha to serve on the International staff Still, our new director, Denny Stiers, took us back to the International contest stage in 1986, 1988 and 1990. All the traveling around the country to compete on the District and International levels was taking its toll on our treasury, so we started looking seriously at other new ways to raise money. One of these-was a booth at the Lane County Fair where, for about six years, we were the sole vendors of Tater Pigs, a delicious mini-meal consisting of a baked potato containing a cooked breakfast sausage and slathered with cheddar cheese, sour cream, and/or butter. Our alterative offering was Kielbasa in a bun smothered with hot sauerkraut. For a couple of years we also offered Euphoria chocolate ice cream bars. At the 1988 International contest in San Antonio, we were clowns and our costumes and songs fit right in when we put on a special performance of our package at the Hertzberg Circus Collection museum. They loved us (but it sure does get hot in a non-air-conditioned museum building in Texas in early July wearing costumes and full facial makeup). 1988 was also the year when we contributed a quartet, our own McKenzie Touring Company, to the Hult Center production of The Music Man. 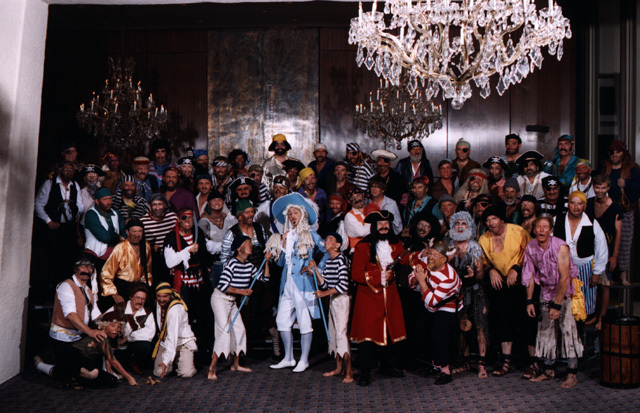 Two years later, we were once again on the International stage, costumed this time as pirates snarling “Aargh” at director Stiers as he tried to control us Since we were in San Francisco, we naturally invaded Fisherman's Wharf in our free time but not in costume. And we continued to entertain at special events in town. 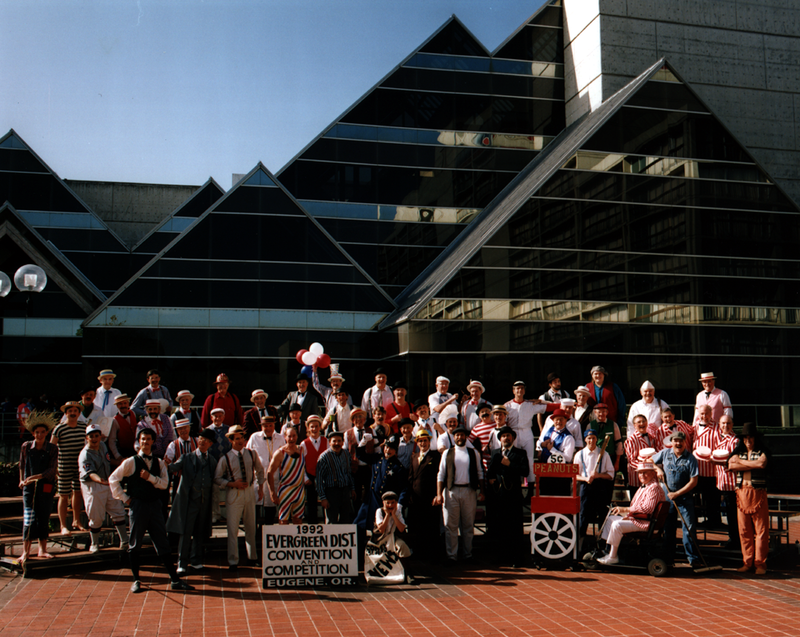 In 1989 ten thousand people came to town for the World Veteran Games. We sang at the opening ceremonies at Hayward Field. Not long after this we lost our director to a career move and after a search and some turbulence we promoted from within, selecting as our new director a 2l-year-old U of O graduate student, Gabe Caretto, who put us back in costume in-a "Forties" package and worked us hard until he got his degree and a job elsewhere. And along came Jim McKee and here we are. One of our most rewarding (musically, financially and emotionally) annual projects since 1991 has been Singing Valentines. It's truly an all hands evolution for the chorus members and many wives. For a fee, on a couple of days around February 14th chorus quartets-registered and pickup-dash around the area singing romantic songs in the barbershop style (and delivering small gifts and a card) to the spouses and sweethearts of our customers. Even quartets from the Greater Eugene Sweet Adeline chorus participate. From the smiles and tears which greet our singing, we have no doubt that our customers get their money's worth (there is no truth to the rumor that one of our customers was the wife of a guy who was fooling around and she sent us to sing at the motel room where he was doing it). The project becomes higher and higher tech, one recent addition being cellular telephones connecting each quartet on its rounds with Valentine Central where the master schedule is maintained and emergencies handled. We had another “first” in 1992. Although we didn't attend the International Convention in New Orleans, we were represented there by Secret 4-Mula, a quartet only one member of which was also a member of the Society. After having won a competition on the District level, they competed in the first ever College Quartet Harmony Sweepstakes and came in third! The fact is, they were only three Ducks and a Miller (that's three students from the University and one from Springfield High School). 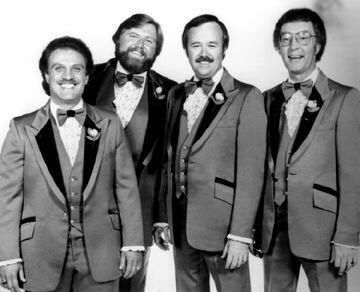 Then in 1995 our McKenzie Touring Company quartet, led by bass Tim Knight, one of our most dedicated members and leaders over the years, entered the Buckeye Invitational, an independent competition in Ohio, and came away winning first place in the Comedy Quartet category. They sang a three-legged-man set that well may be the funniest any audience has ever seen. As we close out our first half-century the Cascade Chorus is a proud, capable singing organization continuing to honor our past members, entertain our audiences, produce excellent quartets and compete enthusiastically with our colleagues in other chapters.